This morning, down by One Mile Creek, a lone Crested Pigeon was fossicking about in the bracken when I came along. As I drew closer it seemed unperturbed by my presence, kept pecking away at whatever grubs lay beneath the dry leaves. until it settled under a shrub. I followed to within less than three metres. It knew that I was a friendly photographer and posed for a portrait. 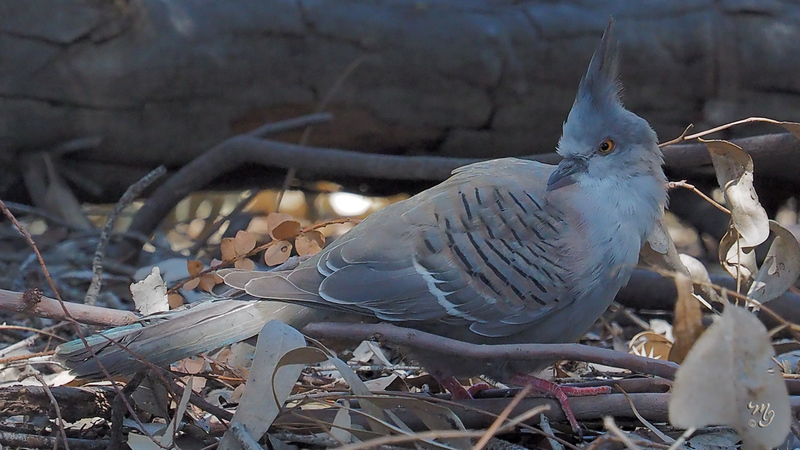 Re: Crested Pidgeon - M5 Mkii + 40-150mm + X1.4 tc. Mark, that is one wonderful capture. Perfect focus on the eye and great composing. Hi Mike, thanks for the feedback. You have probably had such lucky breaks yourself as I did with this bird. I could hardly believe that it allowed me so close without a trace of anxiety. I almost felt in rapport with it.